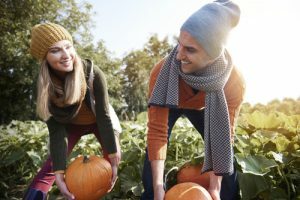 Unless you’re sticking with gourds for Halloween decorations, lifting a pumpkin can cause a herniated disc, pulled muscle, or sprained back ligament. The pumpkin you choose to turn into a Jack o’ lantern will likely be your biggest purchase, and it could run an average of 20 pounds. Lifting with your back instead of your knees can do serious damage, as can lugging a few big pumpkins around the patch. Squat down to collect your pumpkin and straighten your legs to get it off the ground. Even using a wheelbarrow or wagon to carry your pumpkins can hurt your back if your chosen cart isn’t at a comfortable level for placing the pumpkin inside it or is too heavy to pull around without twisting your back. When in doubt, bring a strong friend to the pumpkin patch. How can a costume cause you back pain? The costume itself could be taxing on your back if you’re wearing a large headpiece (like horns or oversized hats), if the get-up requires you to hold a heavy accessory that has you leaning to favor one side, or if you must position yourself a certain way to be convincing (zombies, mummies, the hunchback of Notre Dame, you get the idea). One of the biggest problems with costumes, however, is not their design, but their side effects. If your vision is compromised by a mask or a long skirt or cape can get tangled up in your feet, you could easily trip or be pulled off balance. Whether the fall is serious or minor, the result could be a sprain, break, or chronic back pain. You may think it’s the safe route to stay home and be the designated member of your household to hand out Halloween sweets and treats. Unfortunately, this activity comes with its own risks. Every time you open the door and look down at your visitors, you are straining your cervical spine. Hunching over will tax your back after an hour or two of doorbell rings. Squatting is a great way to minimize neck strain, or you can be the ghost on the porch handing out treats from a comfy chair as trick-or-treaters approach. If you’re really in pain but want to avoid getting your house egged, leave the light on and a bowl of treats on the porch. The goblins will be operating on the honor system, and hopefully they’ll oblige. Hurt Your Back on Halloween? Don’t get tricked by the hidden dangers of Halloween. Plan thoughtfully so you can enjoy the fun without hurting your back or neck. If you do find yourself haunted by pain, schedule a consultation with the Restorative Wellness Center in Ann Arbor.